Bagels are a beloved contemporary staple for breakfast, snacks, or even a yummy bagel sandwich lunch, but they have actually been around for centuries. They originated in Poland in the 17th century. Polish immigrants brought bagels to the US, which gave birth to the famous New York bagel that so many of us know and love. This also prompted bagels to expand throughout the US, which has ultimately allowed us to enjoy them today! We love to top our bagels with flavorful cream cheese, but this can be hard to accomplish in a mostly plant-based diet. Follow Your Heart comes to the rescue with their delicious and creamy vegan cream cheese, which we have flavored with chives and our very own CBD Superfood Golden Spiced Coconut Oil. It’s the perfect way to start your morning or to seek some afternoon nourishment! Slice bagel in half and toast until both sides are golden brown. In a small bowl, mix 1/4 c. vegan cream cheese with CBD Superfood Golden Spice Coconut Oil and spread on one of the bagel halves. 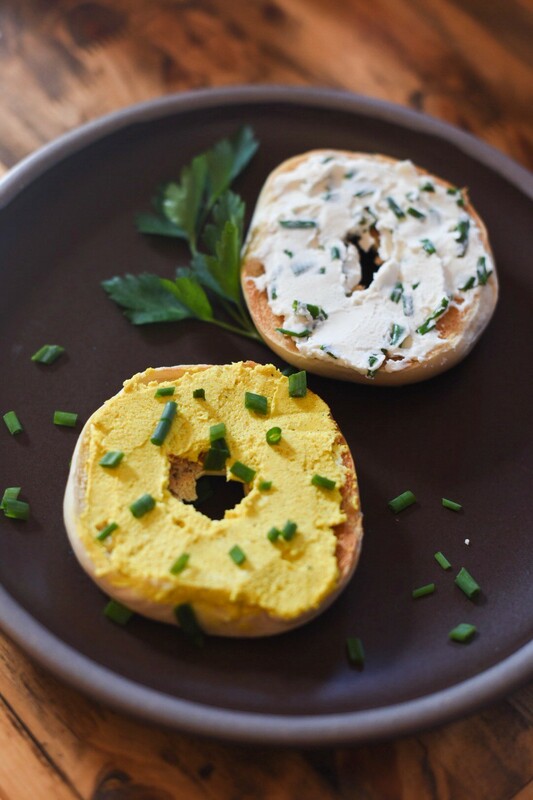 In another small bowl, mix chives with the remaining 1/4 c. vegan cream cheese and spread onto the second bagel half. Sprinkle both with chives, and enjoy!